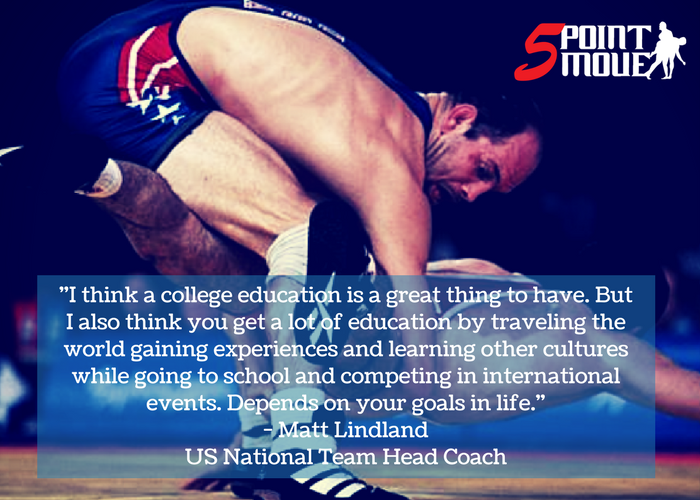 Five Point Move is proud to host US Greco-Roman National Team Head Coach Matt Lindland every week for “Coach Lindland’s Report.” For fans and wrestlers looking for insights regarding the US Greco National Team, we ask Coach Lindland questions pertaining to recent events, training, and other topics surrounding the sport of Greco-Roman. If you have any questions you’d like us to ask going forward, let us know via Facebook, Twitter, or through our Contact page. This week, Coach Lindland has just returned to Colorado Springs from his hometown of Portland, Oregon, where he attended a USOC Coaches Seminar, so that is part of the picture. 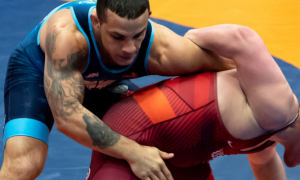 The performances over the weekend at the Hungarian Grand Prix are front and center right off the bat, as the US put two wrestlers on the podium. 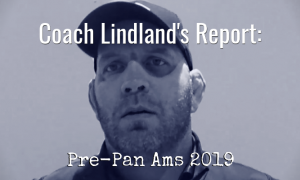 In addition, Coach Lindland talks about his time in St. Louis for the Division I National Championships, a new program at the Olympic Training Center, and the disappointing news surrounding Greco-Roman’s exclusion from two noteworthy events. 5PM: Through the three overseas events in March, US wrestlers won 10 medals with three golds, one silver, six bronze and 57 total wins. Is this the kind of success you were expecting prior to leaving for Denmark? Coach Matt Lindland: I was very impressed with the way our athletes competed. Not just necessarily by the results really, but the way in which they’ve been going out there competing. They are making attempts. They are wrestling with a style to score points and win matches. They are not wrestling to protect anything. I think that is what it’s going to take. Over the last few months we’ve seen a guy like (Alex) Sancho come up short a few times in the US. 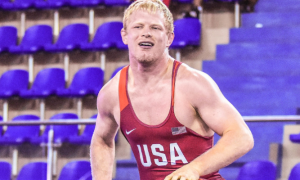 One time at the Open, one time at the World Team Trials at 71, and I think there was another time where he just came up short against an American. And I felt like what he was doing was right, that the way he was wrestling was correct. But that is hard to say to a man when he’s losing matches, But you’re doing it right, keep doing it, because I honestly felt like maybe when he gets overseas that style is going to pay dividends and it did, certainly. He won a gold medal. I don’t know if anybody saw the throw that he hit where he started an arm throw and the guy (Mate Nemes) almost stopped it, but he grabbed the guy’s shoulders and pulled him over the top. It was ridiculous. I’ve never seen anyone do that. It was incredibly creative and when you’re wrestling the way Alex does, you can be creative. You have some latitude with creativity and we’re seeing that. Kamal (Bey) is creative, even Tracy (G’Angelo Hancock) is becoming a lot more creative with his attacks, and everybody as a whole. When you focus on position and you focus on fundamentals, your athletes can go out there and perform because they have to take risks. There is no way to win matches without risking something. So I was very happy with the results and I was very happy with the way the guys competed. They fought hard, they were well-conditioned, and they went out to score points. Obviously, every guy has areas we can continue to improve on and will continue to do that as we head into the World Team Trials. Everyone is preparing their athletes appropriately, getting them ready, and I am looking forward to having the best possible team when we head over to the World Championships. 5PM: Getting to the Hungarian Grand Prix let’s go in order. Geordan Speiller had some dominant moments up at 80 kilos again, losing in the final to (Peter) Bacsi, one of the best in the world and someone Speiller defeated at this same event last year. How do you think Speiller has looked in his performances since he’s been back toiling at 80 and also, is there anything about his skill-set that surprises you anymore? ML: Geordan doesn’t surprise me anymore because I’ve spent enough time around him. He’s a very technical wrestler, ultra-competitive, and relentless on his attacks. He’s level-changing, he’s making attempts, he’s putting himself in situations where he can score by taking risks. I love the way Geordan competes and the results are definitely showing that and his results have been at 80 kilos lately. He won the Schultz, he won the tournament in Cuba, the Granma Cup, and then took a silver over here. Unfortunately, I wasn’t on either of those last two tours. I came home after Croatia and we sent Coach Mohamed (Abdelfatah) to the training camp (in Hungary) and the competition for the athletes. The only way you can see those films currently is if you watched the live and I was traveling to the USOC Coaches’ Seminar, so I didn’t actually see any of the matches yet. But I do know the way Geordan competes, it’s relentless attacks, he scores points, and he loves to throw guys. That is really going to be great and pay dividends for the US program. It’s already paying dividends, to tell you the truth, because we’re starting to see guys become ranked in the world. Now we have five guys ranked and I can see Speiller moving up in the rankings, as well. So possibly when the new rankings come out we’ll have more guys. I love to see him (Speiller) at 80 and winning at 80, and I wonder if he will stay at 80 for the Trials or if he will come back down to 75. I feel our athletes perform well when they don’t have to cut weight. 5PM: Aside from Speiller, Daniel Miller’s heroics to win bronze were quite memorable. What is it about Miller, and maybe this is somewhat related to Sancho just a little, but what is it about this guy and overseas events? He seems to perform better outside of the US. ML: (Laughs) He does, for sure, seem to perform better. I don’t know what it is. He kind of reminds me of a big Bryce Saddoris. He is a good character man, works hard, attacks, he came in through the same system in the Navy program and now he’s in the Marines, he’s an officer, and they both have that in-your-face, stand-right-in-front-of-you-and-battle-me kind of attitude. But I’m really liking the ways Miller is scoring points and I did see a couple of those clips. I saw that beautiful high-dive attack and if you haven’t seen it, go to the Five Point Move Instagram, it’s on there. It was a perfect attack for a guy who has been in a folkstyle system. He level-changed, penetrated, got to the body, and it was in a clutch situation. Then he scored and won the match. It’s great that we’re starting to see more depth at that weight class. I don’t doubt that some of those 98 kilo guys are going to change, whether because the weight moves up to 100 or if they go up for that 125, especially with the two-hour weigh-in, those weights are going to change. We’re going to have some guys who are capable of moving up to that heavyweight spot and we’ll have guys who will stay at 98 kilos. It’s good that we’re starting to develop depth within our program with these current athletes. 5PM: One of the most exciting bouts of the day, right up there with Miller’s bronze, was John Stefanowicz nearly pulling it out against Zurabi Datunashvili. He lost on criteria 4-4 and in the waning seconds of the bout almost hit a four to win. But even before that, Stefanowicz was just constantly attacking the entire time. It was a terrific match, especially given the quality of opponent. Is this kind of approach something you’ve noticed about Stefanowicz before? Coach Matt Lindland: You know, I haven’t noticed that kind of relentless attack out of Stefanowicz in the past. He is kind of an up-and-comer, but I know Coach Jason Loukides is building an incredible program over there at the Marines. He’s got some really good, talented guys. He has some really good talent coming up. I’m hearing some great things. The guys are getting behind one another, they are cheering for each other, they are supporting each other, and you’ve got the right coach out there throwing the cube and trying to get the right calls. And we’ve got guys who are going out there attacking and putting it all out there. They’re not timid. They are attacking, they are aggressive. This is what the world expects from us, a relentless attack, and now we’re scoring points on top of that. We’re winning matches and getting guys to compete with the rest of the world and come away with medals. So I’m loving the direction the program is headed in as a whole and I’m loving what the Marines are doing. Jason is going to be on our World Team staff this year, we’re excited to have him on board, and I’m hoping that he gets one of his guys on the team, as well. All in all, I was very pleased. Coach Mohamed was calling me every day at camp and during the tournament. We were able to connect every day. You didn’t have that luxury a few years back. Now, we’re talking every day overseas and it doesn’t cost you anything because you’re going off of Wi-Fi. We can talk and discuss what’s going on, so he filled me in on the results and what was going on in training. 5PM: Joe Rau got back in gear, getting two matches in. He lost to Belarus, who was a bronze in Rio at 85, both he and Miller did. This event and the preceding camp were more about him finding his shape again. How important was this trip to an athlete like him, especially with the Trials coming up? ML: I think it’s critical. Joe was coming off of surgery and he was not ready to go to Denmark and Croatia. He called me up and said, “Hey coach, I’m ready, I’m back on the mat.” I said, “Well, yeah, we’re leaving tomorrow. Why don’t I send you to Hungary so you can get a great camp in and some competition?” It’s great to see Joe back on the mat and injury-free. His conditioning wasn’t there, his timing wasn’t there. He hasn’t been on the mat. 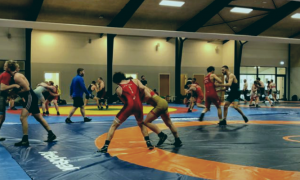 His first two weeks in Europe were his first time back on the mat. So I’m not at all disappointed where Joe is, he’s an incredible competitor. He is not a “practice room wrestler”, he’s a great competitor. But when you’ve had two weeks of training, you’re probably not ready for the Hungarian Grand Prix, which is a tough event with tons of talent and lots of great guys. But I think Joe is going to be fine heading into the World Team Trials. 5PM: Here is one that is nice and easy — how did you enjoy the D1 National tournament? ML: The Division I Nationals are always a fun event to go to. You see so many people you know. It’s the who’s-who of wrestling. Anybody who seemingly ever wrestled or coached is there. You get to see a lot of your old teammates from college, guys you’ve competed with and against. That part of it was fun. The competition was amazing. What Cael Sanderson is doing with Penn State is nothing short of incredible. It seems these younger guys, we’ve had multiple freshmen (win), I know for sure two of them were true freshmen from Penn State and what that’s telling me is that if those guys were in an international system, they would be having as much success internationally as they are domestically because they are great wrestlers and great competitors. They have coaches who are preparing them to peak at the right times. Imagine if these guys were representing the United States in either freestyle or Greco, depending on where their skill-sets lie? But maybe they are folkstyle wrestlers and that is where they are going to do best. There are certainly guys who are international wrestlers stuck in a folkstyle system just because that is a well-worn path, that is the tradition, that is the way it has been done. But when you look at what’s going on internationally, when I was competing and I came out of the college system, it took me a few years to make my first World Team. It took me three more years before I got a medal and by the time that happened, I was 30 years old. At 31 I won another medal and then moved onto MMA because I had to make a living. We lose a lot of these athletes post-college because you know what, I’ve put in four years, five years, I’ve got a degree and it’s time to make some money. But what if those guys were wrestling internationally and were getting their college educations competing internationally, like our guys are doing? We can start really putting a lot more guys on the podium for the United States. I think Coach (Kerry) Regner said it really eloquently. He said, “There are just some guys who are just Greco guys”, and we’re pushing guys towards a one-style-fits-all system. Go to college and then you can pursue your international aspirations. What he said is like having a pitcher who can throw a 99 mile-per-hour fastball and you’re sticking him at second base. And that is what we’re doing with a lot of our best wrestlers. 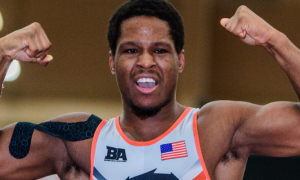 I have a few of them out here this week who are in college systems and they’re out here not just because they want to make a World Team, but because they are capable of making one of our Junior World teams. They’re out here getting some training in but it’s not the ideal situation. 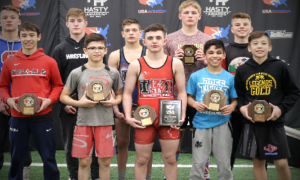 They are here training but then they will go back to their college programs and they won’t have great Greco training partners, they won’t have Greco coaches there. They are going to try and do it on their own and they’re going to get the results they get because they are not in the right system. But on the same token, we’re happy to have them here and we’re happy to help them achieve their goals, even if we can only have them for a week or two. 5PM: Who did you see while you were in St. Louis that you can imagine becoming Senior competitors in Greco? Matt Lindland: I think the first guy who comes to mind is Bo Nickal, but he’s a sophomore. There is so much talent out there and I’m not going to be able to name all of the guys. We’re just sitting here chatting on the phone, so I’m going off the top of my head. Somebody who I’ve been very fond of for the way he competes and the way he carries himself is Gabe Dean. I think Kyle Crutchmer is a beast on the mat. He can be very successful in Greco-Roman. Sammy Brooks had a lot of success in Greco-Roman in high school before moving onto the college system. There are tons and tons of talented wrestlers out there and the big thing is, athletes need to know there are opportunities available to them. We have two college programs where they can get degrees while competing in Greco-Roman. There are guys out here who are resident athletes at the Olympic Training Center working towards degrees and not only that, but they are traveling around the world and capable of completing their coursework online. They have a program where they meet with their counselors and tutors and do so online. It’s an incredible system for someone who wants to reach these kinds of goals and the only way to do it is to be overseas and be in the training environment. It is very difficult to do if you are not in the right training situation and we have very few in this country. And the few that we do have, the Minnesota Storm, the Marines, the Army, the OTC, the guys who are in those right environments are capable of it. But you can’t do it if you’re wrestling folkstyle at Iowa, Penn State, or Oklahoma State, it’s hard to reach those international goals because they have college goals, and that’s fine. It’s fine if your goal is to be a college champion. But if you’re telling me and everybody else you want to be an Olympic champion, then you’ve got to get yourself in the right program. You have to get yourself in the right system because it is going to be very difficult. We’re starting to see younger guys do it and unfortunately, that’s just the nature of it. Like I said, you could potentially do this when I wrestled, but I’m not seeing that path anymore. I’m seeing that guys need to take a different path to reach the goals they want to reach. It really depends on what athletes want to do. We did see J’Den Cox get an Olympic medal while he was in college. That was in freestyle. It’s a close cousin of folkstyle. Greco is a lot different. You know, I’ve got guys here and I have guys coming in this week and it is their spring break. My wife was laughing, she said, “This is their spring break and they want to spend it with you?” I said, “Well, they have big goals, they want to make World teams, they want to represent the United States at the World Championships.” She followed up with, “They should move out here then, if those are their goals.” But I think it’s just there is his pressure on these athletes, the system, that, This is the way you have to do it. They want college educations and I don’t disagree. I think a college education is a great thing to have. But I also think you get a lot of education by traveling the world gaining experiences and learning other cultures while going to school and competing in international events. Depends on your goals in life. 5PM: Can you talk about the Accelerated Developmental Program and what it means for athletes and potential athletes at the Olympic Training Center? ML: Yeah, well, this is a project that we as coaches, and not just the Greco-Roman staff but the freestyle staff, the women’s program, we have a vision. Just like I do, they are seeing the same thing — younger athletes are capable of getting on the podium. So how do we get athletes in the right training environment? Well, we have to create a program within our system to recruit and develop the elite Junior athletes. We presented this to the USOC and nothing moves fast within that organization. Nothing moves fast with any of the NGB’s or the USOC, so things take a while. But we got some answers, some good news and some okay news. Honestly, the great news is the fact that we’re going to be capable of giving our athletes a better education than they are going to be able to get at any public school system. This is through the public schools, it is what’s called a “multi-district system” in the state of Colorado. Whether an athlete moves here or he/she is a resident of Colorado, they can participate in this schooling. They don’t necessarily have to be athletes, though there are a lot of athletes in this program. Some other sports, I think gymnastics and figure skating, have pulled one or two athletes from this program in this school already. There are three things you need, Tim. You need the right training environment, which we can provide at the Olympic Training Center. You need the right education environment, which we’ve created with the Springs Academy. Athletes can go on campus when their schedules allow, and when their training or international schedule conflicts with that, they can work online. So again, we are talking about a blended education system. The old, Do it the way it has been done for 100 years has got to be changing at some point. We’re learning more and that might not be the best system for a young adult who is very active and have them sit there for eight hours a day, five days a week. We’ve known since the Greeks it’s mind-body, you have to exercise and think, you have to blend those two types of learning. We have the training situation and we have the academic situation figured out. The last piece is the housing. I guess housing, social development, whatever you want to call that, it’s a big thing. Right now, we don’t have the housing unless one of our resident beds opens up. What it did was give us a bed for a resident liason, which we need to plug in. That could be a young assistant coach looking for a place to live, free meals, and maybe an internship with the National Team program. Or maybe this is a young teacher from the Springs Academy who is living on campus with us and they are tutoring at the Olympic Training Center. We haven’t figured out that piece, we don’t have that piece because the USOC did not fund us beds. But we’re excited because we have the opportunity and now we just have to find that housing piece. As I’m brainstorming through this and I’m talking to people, what if the six guys I have as resident athletes and we find a house for them, or move them into two houses? The older athletes are off-complex and we move the younger athletes in. I know that as a 20-something or 30-something year old athlete, I wouldn’t want to be living in a dorm situation. But it is ideal for a 17, 18-year old athlete to have that access from his dorm room to the cafeteria, from the cafeteria to the training facility, to the strength room. It’s all there, it’s all on campus for these guys. We just have to figure out that housing piece. It goes back to the fundraising. One of our biggest goals is to find a housing situation so we can get more athletes into the proper training environment at the OTC, which is probably going to require moving some of our older athletes off-complex. They aren’t going to lose access or anything, they are just not going to live on-complex. They will have a lot more freedom and autonomy in their own house, as they all should. But a young adult should have more supervision and direction on campus. I think we can figure all of this out, it’s just when and how exactly. 5PM: That kind of leads into the next question, which is, when you talk to athletes, regardless of age, who are coming out to the OTC and they’ve never been there before, what it is about the place they seem to be the most attracted to? ML: Colorado is a pretty beautiful place. For me, I wake up every morning and I see the mountains. If you’re into that kind of stuff, it’s a beautiful place to live. From my house, which is three blocks from the training center, I’m right near Palmer Park, the largest park in America. It sits right in the heart of the city and there are hundreds of miles of trails. You can go to the Cheyenne Mountains and on the other side of that is Pikes Peak. You can get out of here and 10 minutes in any direction, you’re completely surrounded by nature and the mountains, and I think nature is great for the soul. Especially when you are couped in a dorm and training, you have to get out and experience nature. You have to refresh your mind and you have to connect with nature. We don’t get a lot of rain here, so it’s a little dry. I just got back from the northwest and I was so happy to breathe again. I was at elevation and it was a lot of rain and moisture. To me, water is life. It’s what sustains life. Here, we get the snow and whatever in the winter. I think the other things the athletes like is being around that environment. You are amongst the elite people. Whether it’s the coaches or the other athletes, everybody wants to be the best in the world. Not the best in their room, not the best in their college or the best in the country. They want to be the best at what they do in the world and I think that is truly inspiring, to be around that group of people. 5PM: Beat the Streets released the matches scheduled for this year’s Times Square event and Greco isn’t in the picture. This is, perhaps understating it, pretty disappointing news. ML: Yes, it is disappointing for us, too. I would love to showcase our athletes and the way the guys have been performing, competing, and putting on exciting matches. It would be very nice to have our program represented at that event. But it is not a USA Wrestling event, it is a private event. Beat the Streets puts it on and it is a private non-profit organization. When I came on, the first year we had two athletes, Spenser (Mango) and Andy (Bisek). Last year, we had Andy and this year, we have no one. I just don’t see the support in the United States for Greco-Roman. I think it is just the fact that within this community of wrestling, people are close-minded and don’t understand that there is a lot bigger sport out there worldwide. We’ve talked about this a lot of times. But the show is produced in America, so it makes sense for them to not have Greco-Roman, apparently. We’re seeing it across the board though, to tell you the truth. Last year, there was the College Duals for freestyle and they had 24 teams show up there. They also had Greco-Roman, but only four teams competed. That is just a lack of support, a lack of participation. Teague Moore said it so well last year, everything he said was right. But this year he informed me that there isn’t a venue for two days, so they are canceling the Greco-Roman portion. He is the chairman for the University and Junior age divisions, for all of the styles and both genders. I would think as the chairman for that age division, your mandate should be to increase participation, increase numbers, and increase opportunities for athletes. When you cancel half of our sport, you’re not fulfilling your end of the obligation. I know Teague Moore and Joe Russell are important advocates for our sport, it is just disappointing. So yes, it is disappointing that we aren’t included in Beat the Streets. It’s disappointing that Greco isn’t included in the college duals. Frankly, it’s a slippery slope, because if you don’t include Greco for the University division, then why the hell am I going to do it as a Junior? So then we might as well just cancel it for the Juniors. It’s all just going to trickle down. It is already under-represented across the country at every age group. It’s like a part of your business that is suffering. Maybe you give that part of your business more support and resources, unless your goal is to actually kill that part of your business. We are up against a lot of obstacles here with Greco-Roman in the United States. That’s where we’re at. 5PM: You just attended another USOC Coaches’ Seminar in Portland over the weekend. This was what, your third? ML: No, actually my fifth. 5PM: Oh okay, well, what did this one entail? ML: The seminars are part of a continuing education process for the coaches. I got the opportunity to join this when I came on as National Team coach. I applied and I got accepted. I’ve always been into continuing education. Before I even got hired, I was in a coaching course. I think it was (John) Wooden who said it, “It’s what you learn after you know it all that counts.” As a coach, you always want to continue to educate yourself because you’re always pouring knowledge into other people, so you say, When it is my turn? When do I get to grow? So as a coach, you love these opportunities to grow and learn and not only that, I’m surrounded by brilliant coaches. Whether that is a bobsled coach, a figure skating coach, beach volleyball…whatever the sports are, these coaches have the experience, wisdom, and knowledge and I get to spend time around them. This time around, the course was more of a recap. We went over what we’ve learned, some of the speakers who have appeared before came back and shared new information. That was the first day. The second day, our assignment was to present what we learned throughout the five courses. Everybody kind of went through, Course one, this is what I learned, course two, this is what I learned, and so on. I took a different approach and said, “Here is what I learned and I am going to show you how I applied it.” I actually presented what I showed our athletes at January camp because every coach, certain things hit them them more, such as how to communicate with athletes. Well, I was a communications major, so I had decent public speaking and interpersonal communication skills. I’m not saying I’m an expert in that at all, but it’s a realm I have a pretty good grasp of. For me, it was culture, building the culture. That was our first course and it was like, You know know? Right now, Greco-Roman needs a culture. I need to create that and share it with our athletes. So I presented it and went over what we talked about numerous times here, which is paddling the boat in-sync and communicating with one another, we’re on the same page going in the same direction and if somebody falls out, how do we get them back in the boat. Metaphorically, getting that guy back in the boat in with us so we’ve got all that speed and all that power moving forward. I took my colleagues my colleagues and our instructors through how I presented it. Frankly, I think it went off very well. It was certainly unique in the way I presented it because it was different from absolutely everybody else. I showed how I applied what we learned. We also shared this with the incoming course, which you know, Bill Zadick is now a part of and Terry Steiner is actually going to jump back in that course because he started course one with me and his travel schedule hasn’t allowed him to make any other conferences yet, so he is going to start back over. So yeah, it was in Portland, Oregon, I got to go home and see my kids. I don’t know if you saw my Instagram, but I got a little kayaking in. ML: (Laughs) It was a nice Sunday and I traveled back on Monday. I thoroughly enjoyed myself. I saw my kids, I saw my dad, I saw my 94-year old grandmother, and one of my mentors out in Portland. Just a lot of great things and it rained a couple times. It was refreshing. 5PM: Denmark, Croatia, St. Louis, Portland, now home…where are you off to next? Coach Matt Lindland: I get to go up to the Combat Wrestling Club in Blue River, Wisconsin. I did this camp last year for these athletes. This is one of the few clubs in the United States that is a Greco-Roman wrestling club. They are not a folkstyle club that has Greco-Roman as an add-on. 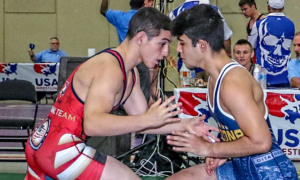 Listen, this is what I hear all the time — We do folkstyle, but as soon as the spring comes around, we do freestyle and train Greco once in awhile. This is a Greco-Roman club. The proof’s in the puddling. Look at what comes out of Wisconsin: Dennis Hall, Ben Provisor, Jesse Thielke, those are just current guys, you know? But we also have a lot of talent coming out of the Cadet and Junior levels in Wisconsin. And it is because they put a focus on Greco, they put an emphasis on Greco, it’s a priority for them. It’s not a second thought like it is for most clubs. So I really appreciate that and I enjoy going out there. Last year, I presented a very basic and fundamental curriculum and I realized that, Yeah, it’s great to review the fundamentals, but these guys get it and we can move on. It’s not like I am going to have to start over and teach the same stuff. I get to teach more, I can share more information and expand their training because they are already using the stuff. They didn’t put it away when folkstyle season came. They are Greco-Roman wrestlers and they are improving, so as a clinician not only am I going out there, but I am taking one of our elite Junior athletes, Tracy Hancock. He is very relevant to this age group, it’s like, Hey, look at this guy, he wrestled Greco-Roman for two years and he won a World medal. You can do this, too! I am really excited to go out there and spend time with Coach Lucas (Steldt), his staff, and all the athletes up there. I’m grateful for this opportunity.